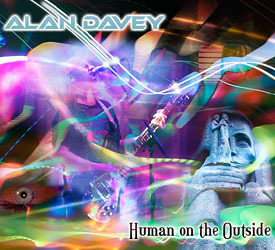 Alan Davey, bass player in Hawkwind, is back with his newest solo CD. He has released quite a few things in the past years. This goes back to the days where Alan recorded all of the instruments on the record himself (not always a good thing). The CD features 13 diverse tracks from purely instrumental mostly synth music, very Hawkwind like songs and some rocking stuff (but not much) as well with many more keyboard solos and than guitar solos. The CD begins with a short synthesizer piece (Atmosphere) and this leads into Years ago Miles Away. This track is classic Alan Davey-Bedoiun style melodic space rock with a heavy bass line leading the music and spacey synths darting in and out. Alan’s voice is sadly not what it used to be but nothing can be done.. He still sings ok… This could easily have been a song on the last Hawkwind record. Eyes Closed is another instrumental track and starts with some samples and then the bass kicks in and leads the track with the melodic synths. Could be a sort of indie space rock track.. Drum Head is a strange short piece with massively excessive bass. Marine Snow is a new agey track that you mom would like and sounds a lot like the synth filler tracks on some of the Hawkwind records (probably because Alan wrote those as well!). This goes straight into Nothing is Weird which features a female singer (sample). Not that interesting of a song. World of Fear is a very melodic space rock track. Ethnic Mosaic Pt1 and 2 are instrumental pieces and quite cool. The 2nd part becomes a bit new agey at the end. The Unseen is a deep space drone track with some distorted spoken words. This heads into Delusions of Ganja, a down tempo bass and synth driven number with some guitar and a mysterious feel to it. Quite melodic..
Dog Star is short another synthesizer space out that leads into the heavy rocker, Glass Wolves, which features Metatron on vocals from Meads of Asphodel and a guitar riff like Angel of Death by Hawkwind. A very solid CD and fans of Alan’s music will not be disappointed but don’t expect a lot of rock music.. The latest from Hawkwind alum Alan Davey is a varied set of heavy space rock, floating cosmic excursions, space infused progressive rock, and well crafted mixtures of all. After a brief spacey intro the album launches into "Years Ago Miles Away", a classic space rocker that recalls the best of Alan's contributions to Hawkwind. A solid song that rocks hard but includes more ambient bits too, plus fiery instrumental sequences and an all around great combination of space rock and progressive elements. "World of Fear" and "Delusions of Ganja" are two other excellent Hawkwind styled songs, with the latter having some of the best instrumentation and thematic development on the album. The aptly titled "Ethnic Mosaic part 1" combines steady driving ethnic and rock percussion patterns with Hawk styled instrumentation. "Ethnic Mosaic part 2" continues the theme but eases up on the tribal drumming at first to let the keyboards develop the music, which once again has a soundtrack feel. "The Unseen" is a space ambient dreamy track with Calvert-esque spoken word. And "Glass Wolves" is an excellent heavy rocker with vocals by Metatron from Meads of Asphodel. I've enjoyed all of Alan's solo albums and side projects, and thinking back on them all there's an impressive variety that demonstrates that Alan is an artist that won't be limited by his association with Hawkwind. "Human on the Outside" features an exciting diversity of music that all comes together to make for a solid album that flows seamlessly from start to finish.